The root of the tribe's name generally means 'of the horn', signifying a peninsula, and was relatively common with Celtic tribes in similar areas. The Cornovii clearly were not peninsula dwellers, though. The root of their name is more obscure, perhaps referring to a god. An educated guess would be that they were worshippers of the 'Horned One', Cernunnos (note that this is the Gaulish pronunciation; the British one may have been different). The root is 'corn', meaning 'horn', just as it does for the peninsula-dwelling Cornovii. Despite the Anglo-Saxon conquest, the deity survived in legend as Herne the Hunter. Possibly this survival happened in the Midlands itself, as the later kingdom of Mercia seems to have been very British in many of its core elements (see feature link, right). The tribe's territory contained a great many hill forts, one of the highest number in the country. The people also appear to have possessed very little in the way of showy jewellery (and pottery), lending the idea that this was a tribe of poor, in-fighting warriors. Their wealth may have been based on other resources, however, such as their salt exports, along with some probable trade in agricultural goods. The wealth would have made it possible to built additional hill forts, an idea supported by at least one expert, so perhaps these were the tribe's true symbol of prosperity. Their distance from the Belgic south-east of Britain makes it unlikely that the Cornovii were amongst the more recent, third wave of Celtic settlers. More likely they were part of the second wave, and had been in the country since as early as the sixth century BC. The tribe may have a connection with the Cornavii of second century Pictland, although this has largely been discounted by modern scholars. They may also have a connection to the identically-named Cornovii tribe of Cornwall, but this is harder to prove or discount either way (although it seems unlikely as the Cornish tribe built no hill forts, while the Midlands tribe were apparently mad about them). By the time of the Roman invasion, a centre of sorts could be found adjacent to the hill fort of the Wrekin and it seems to have derived its name from the fort, although whether it was a recently-formed tribal capital is still uncertain. One suggestion is that it was a seasonal animal enclosure. Another important site was Old Oswesty (Caer Ogyrfan), which seems to have been a more likely candidate for a tribal centre, with the other significant sites being Breiddin (Powys), Bury Walls (near Weston-under-Redcastle), Chesterton Walls (near Romsley), and Titterstone Clee (near Bitterley, with all three of the latter being in Shropshire). The only means by which Viroco can be identified at all is through the grave of his daughter. Her tombstone at the Roman settlement of Verbeia (modern Ilkley in Yorkshire) states that she is thirty years old and the daughter of Viroco of the Cornovii. Although the stone does not specifically state that her father is (or had been) a chieftain, he is probably someone of importance. If the chieftain supposition is correct, he may be a leader at the time of the Roman invasion. The name Viroco could be taken as the root of Viroconium, the Latinisation of the Brythonic name for the tribal centre overlooked by the Wrekin hill fort. However, 'Viroconium' contains the common Gaulish word for a man, 'wiros' (its combining form is 'wiro-'). The second part might be the word for 'together' ('com', the same as in Latin) pushed together along with the plural '-on'. The result would mean 'the (place of) men together', in the sense of 'the comrades', or combrogi, a word which leads to the native name for the Welsh - Cymru. The invading Romans under Governor Aulus Plautius reach the Cornovii in this year, and one battle is fought, at the Wrekin, in which the tribe is defeated. This is the only major conflict between the tribe and the invaders, suggesting either that the Cornovii are not a very warlike people or they lack the tribal cohesiveness to put up an organised resistance. Either option raises the question of why the powerful Catuvellauni had not simply marched in and taken over during their progressive expansion across the south-east of Britain. However, there is the possibility that not all of the tribe's people are welcoming of the invaders. The existence of the Cornavii tribe is recorded in Pictland by around AD 140, suggesting a possible migration northwards of Cornovii people to find a new homeland that is free of the invaders. A tribe lacking cohesiveness would certainly be more prone to divisions such as this. The Cornovii territory is probably used as a supply base for at least some of Rome's subsequent operations against the Silures and limited fighting against the Ordovices to the west, led by Roman Governor Aulus Didius Gallus. 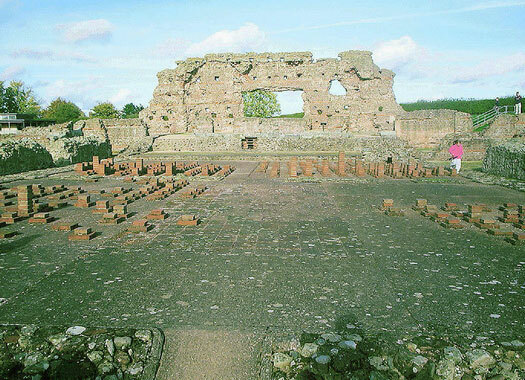 Roman influence is never particularly strong in the region, but a fort is established at Viroconium Cornoviorum, overlooked by the Wrekin hill fort, initially for the Fourteenth Legion for a short period, and then for the Twentieth Legion for an equally short period. With the legions having left Viroconium Cornoviorum the former fort is gradually converted into the fourth largest city in Britiain. The levels of habitation when set against the estimated population size for the city are inconsistently low, suggesting that many live in timber dwellings without stone foundations, making such places harder to find by archaeologists. A forum, basilica and baths are probably begun under Emperor Hadrian in the 120s but are not completed until the 150s, after a period of suspension. Some of them survive today as impressive ruins. The city becomes very prosperous and retains that prosperity into the third century. Early decline appears to set in at Viroconium Cornoviorum, earlier than with many British cities which retain their prosperity until the time of the great barbarian attack of 367. Late in the same century, the only known British military unit, the First Cohort of Cornovii (Cohors Primae Cornoviorum), can be found serving at the Pons Aelius (Newcastle-upon-Tyne) garrison at the eastern end of Hadrian's Wall. By this time the five hundred-or-so men of the unit are probably under the command of Coel Hen of the 'kingdom' of Northern Britain. By the time Roman authority has been ejected at the start of the fifth century, much of the former Cornovii territory appears to form the heartland of the territory of the Pagensis, which is under the control of Vortigern. Viroconium Cornoviorum apparently remains the region's capital, surviving into the sixth century as Caer Guricon. Vortigern quickly becomes the main figure in British politics, forming the head of whatever central authority governs much of the south and east in this century. A theory by Dr John Morris, not fully accepted by modern scholars, is that there are two periods in this century in which elements of the Cornovii are moved into the south-west of Britain. According to the theory, around this time, the leading nobles of Viroconium move to Dumnonia, transplanting their Cornovian name to the western peninsula (Cornubia) and ruling over the Dumnonians. While this theory has many detractors, there does seem to be a tradition of the Cornovii nobility joining that of the Dumnonians, and there is not nearly enough evidence to prove that this nobility is from Cornubia. Perhaps instead it represents a unification of two major and fairly powerful tribes in a location in Britain that offers more safety and better protection than the vulnerable West Midlands (a concern that would be borne out within just sixty years when the Middil Engle migrate into the East Midlands, beginning a wave of advancement in the region). As a continuation of the theory by Dr John Morris, he suggests that at this time the majority of the Cornovii migrate from the Midlands, now within the territory known as the Pagensis, and settle in Cornubia. While in general this seems unlikely, it could take place as part of the general migration of people in southern Britain towards the comparative safety of the south-west and possible migration onwards to Armorica.